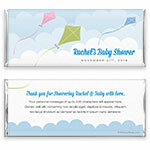 This charming candy wrapper design is perfect for a baby shower, birth announcement, or even a first birthday. Design: Pastel kits on an ombre cloud background. Personalization: Front name, event, date with back title and message.